Macs with access to a printer capable of printing double sided can print any document as a two-sided print, meaning that each page of the document will go on the front and back of the piece of paper, kind of like a book. This is a popular printing method for many situations, whether it’s manuscripts, manuals, documentation, books and novellas, and even just for people who want to save paper. 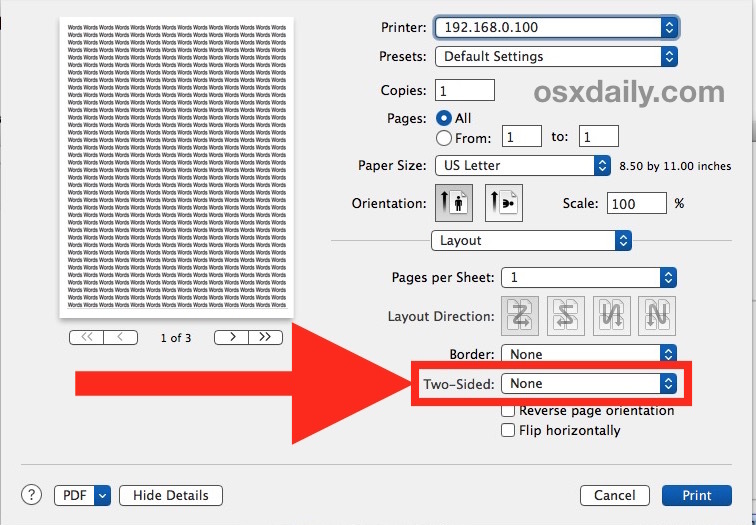 You can print double-sided on a Mac with Microsoft Word, Office, Pages, PDF files from Safari and Preview, and many other apps, and the feature works on all versions of macOS and Mac OS X as well, as this tutorial will detail through the relatively easy process. Before attempting to print double-sided pages, be sure you meet the few requirements which are mandatory in order to use two-sided printing. The first is fairly obvious, the printer itself must be compatible with two-sided printing (sometimes called duplex printing, or a duplex capable printer), which is typically a laser printer or similar hardware. The next requirement is the document being printed must be at a minimum at least two pages long, since the first page will go on one side of the printed page and the next page will go onto the opposite side of the printed page. If you want to buy a duplex capable printer, Amazon has many options if you look for “duplex printing”, they are typically laser printers and available at many different price points. 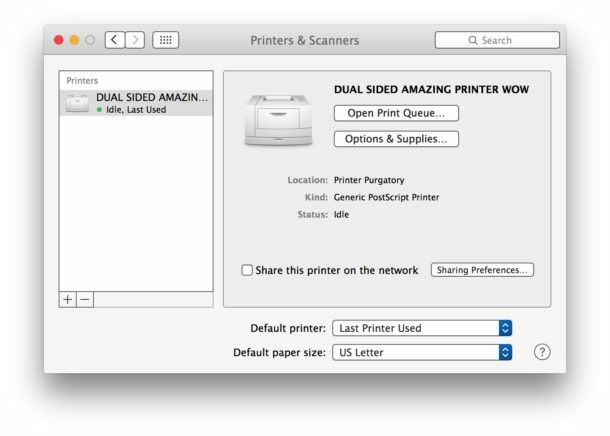 Regardless, be sure you have a compatible printer setup with the Mac before attempting to print dual-sided. Check the printer and you’ll find your two-sided print job should be going as intended. Once you have two-sided printer configured and enabled you can use the print from Desktop methods to print double sided with any compatible files even quicker, without having to open the application they originate from. If your printer is having a hiccup (and when are they not?) or gets stuck, remember you can reset the entire print system on the Mac which tends to resolve most of the typical printer problems that are associated with Mac OS software. Keep in mind many individual printers have their own drivers as well, so updating those and maintaining modern driver software for the printer is often necessary. My Printer is Not Duplex Capable, How Do I Print Double Sided? If you do not have the two-sided printing options, it’s quite possible the printer is not compatible with duplex abilities. If your Printer is not duplex capable and is not able to perform two-side printing on it’s own, you’ll have to manually print dual sided yourself which is a trickier task. Basically that means printing one page at a time, flipping the piece of paper over, and then printing the next page, repeating every other page onto a new piece of paper. For example, paper A would be pages 1 & 2, paper B would be pages 3 and 4, and so on. Yes it would be tedious to do this, but it does work, and if your printer can’t perform two-sided duplex printing on it’s own, that would be the only other option aside from accessing a printer which is capable of dual sided printing. Know of another way to perform double sided printing from a Mac? Have any tricks for duplex printers? Let us know in the comments. This article explains why I can’t double side print a short, 1 paragraph story! If you don’t have duplex printing on your printer and are printing double sided manually,then what is really good is to choose to print “even numbered pages only” in a range,then turn the pages over and choose to print “odd numbered pages only” and you get the whole book done,it works really well,but experiment with say a 4 page document first to get the hang of it. You mention that Pages can print double sided documents, and later in your article the part about choosing long side or short side binding. How do you format the Pages document to then put the appropriate facing pages stuff in the right place, i.e. page numbers and other embellishments that need to be on the inside or outside margin depending on which page they are on — without doing things like turning each page into a section. They will print if they’re included in my experience, may vary per printer type though. Thank you for your answer, but I believe you are misunderstanding what I am asking…. The ability to put page numbers in a Pages document has been there from the start, but after Pages 09, the ability to put odd number pages on the right side of a page and even numbers on the left side is not there. (This is what it means to format for facing pages — like what you find in a book or magazine.) For binding purposes, the left margin on an ‘odd’ page is different than the left margin on an ‘even’ page, for good reason. Look at how the page numbers are formatted. Or just pick a book. Right now, the only way to get that in Pages is to turn each page into a section … which is a very bad idea. Well usually if your print r is not capable of double sided printing, you first print all odd pages, then reload them on the other side in the printer and print all the even pages of your document. You can print both sides of the page regardless of what kind of printer you have. -First go to the Paper Handling dialogue and (if you don’t see it click on the Show Details button) choose the Odd Pages. -Take the printed pages out and put them back in printer. You’ll have to figure out which is the correct way to place them. -Lastly go to the Paper Handling dialogue and choose the Even Pages. I have done this for years with only a few mistakes on many printers and OS’s. If this is a feature in the device why in hell would I want to have to manually do this when it is something that should be done automatically. The option is grayed out and therefore this is just wasted space to detail how to if that option is available, however, if the OS has grayed out that option for some reason or another how do you circumvent this issue. Seem like some presumptuous people are automatically making statements that should not even be discussed when the option and feature does not work. “it’s own”… “it’s own” – it’s “its own”. I have tried everything I can find to get MS Word to duplex print. The Mac print dialogue DOES NOT come up! I goes right a way to printing. Any Help?!?! You are clicking the printer icon in the toolbar. Use the actual print command (command + P) to get a print dialog box. Go to settings – Printers&Scanners – Select your printer from the list. Now click the button “options and suplies”, go to the second tab called “Options” and click “duplex printing” checkbox. “duplex printing” is not on my “options” page; but I know for 100% certain my printer is duplex capable. Where else might I find this check box? In Word 2016 for Mac, hit Cmd-P to bring up the Word print dialog, then click the Copies & Pages dropdown and pick Layout. Click on the Two-Sided: (defaults to ‘Off’) dropdown and pick short or long-edge binding. The problem with Word is that when you choose double-sided in Layout, it will not remember this. If you have 20 documents to print, you have to select “double-sided” for each one. That is my experience anyway, and I have not found any way to make Word remember the setting. It seems that the easiest solution for me is to change the printer cable to my pc laptop. No problems with that. I just can’t see why Apple has to make it so difficult! Note that Word for Mac 2016 does remember two-sided printing, at last. Under Print > Layout > Two-Sided, select “Long-Edge binding”. Word now stores this choice instead of reverting to “Off”.